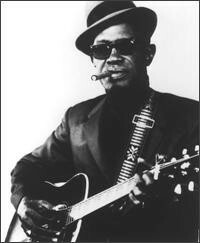 Sam John Hopkins (1912 - 1982), better known as Lightnin’ Hopkins, was an American country blues singer, songwriter, guitarist and occasional pianist, from Houston, Texas. Rolling Stone magazine included Hopkins at number 71 on their list of the 100 greatest guitarists of all time. Musicologist Robert "Mack" McCormick opined that Hopkins "is the embodiment of the jazz-and-poetry spirit, representing its ancient form in the single creator whose words and music are one act".